This tutorial kit includes everything you need for your first steps in programming: an original Arduino™ Uno, breadboard, components, a 282-page manual and software. 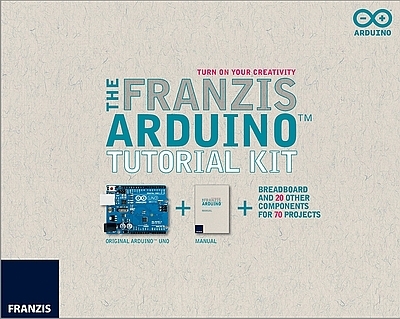 With this kit you can build successful projects and bring to life your Arduino™. Already done your experiment for the day? Whether you want to build a home automation system or an LED lamp with changing colours - with the Arduino™kit even beginners can successfully write their first programs and implement their very own ideas! In this tutorial kit you discover the basics of electronics and Arduino™ programming and get step-by-step instructions to put your ideas into practice. For children under 14 years not suitable !